Las erupciones volcánicas pueden ser precedidas por cambios en la actividad sísmica y vulcanomagnética, en la composición química de los gases, del agua de manantiales y algunas veces por deformación. Para hacer un pronóstico volcánico adecuado es necesario reconocer estas señales indicativas de una erupción y su temporalidad. Las erupciones del Popocatépetl que comenzaron el 21 de Diciembre 1994, fueron precedidas por aumentos en los eventos sísmicos vulcanotectónicos (VTs), cambios en temperatura y concentración de sulfatos y cloruros en el lago del cráter y en la pCO2 en los manantiales. También hubo un descenso en pH en algunos manantiales varios meses antes de la erupción. Los eventos sísmicos de periodo largo también aumentaron antes de algunas erupciones y los episodios de tremor armónico así como las anomalías magnéticas negativas antecedieron a la formación de domos y están ligadas al ascenso de magma. La energía sísmica cumulativa de los VTs muestra una aceleración en la tasa antes de las erupciones principales. Hubo precursores claros antes de las erupciones de diciembre-enero 2001, como son las anomalías magnéticas negativas correlacionadas con el incremento en la sismicidad, así como pequeños cambios en los manantiales. Estos cambios ocurrieron 2 meses antes de la erupción. Adicionalmente, unos días antes se presentaron episodios de tremor armónico de gran amplitud y aumento en el flujo de SO2, esto, junto con el análisis de los datos del RSAM permitió hacer una evaluación y pronóstico adecuado de la erupción de 2000. Palabras clave: precursores eruptivos, señales vulcanomagnéticas, sismicidad volcánica, precursores químicos, erupciones Vulcanianas, pronóstico. Volcanic eruptions can be preceded by changes in seismic and volcanomagnetic activity, chemi-cal composition of the gases and spring water and sometimes deformation. Recognizing these signals of impending eruption and their timing is essential for adequate volcanic forecasting. The Popocatépetl eruptions that began on December 21, 1994, were preceded by increa-ses in volcano-tectonic seismic events VTs, increasing temperature and sulfate and chloride concentrations in the crater lake, decreasing pH as well as rising pCO2 in the spring water. Long period seismic events also increased before many of the eruptions and harmonic tremor episodes as well as negative magnetic anomalies precede dome formation and are linked to magma ascent. The VT cumulative seismic energy rose sharply preceding the main eruptions. Clear precursors were detected before the December-January 2001 eruptions. Two months before the eruption, negative magnetic anomalies correlated with increased seismicity, as well as small changes in the spring water were observed. Additionally, a few days before the eruption, episodes of high amplitude tremor and high SO2 flux were detected and together with the analysis of the RSAM data were the bases for the adequate evaluation and forecasting of the 2000 eruption. Key words: eruptive precursors, vulcanomagnetic signals, volcano seismicity, chemical precursors, Vulcanian eruptions, forecasting. Forecasting volcanic eruptions is a difficult task because of the complexity of volcanic processes and the varying structure and composition of the different volcanoes; nonetheless, advances have been made in recognizing precursory activity. This is especially important in decision making and hazard mitigation in areas with active volcanoes and dense population such as at Popocatépetl that has been erupting since 1994. In this paper we review the eruptive precursors at Popocatépetl Volcano (19.02ºN, 98.62ºW, 5,454-m asl) leading up to the recent volcanic activity since 1994 (Figure 1). The volcano is located in central Mexico, in an area where more than 20% of the country population is concentrated as well as the most important economic and political activity (Figure 2). Popocatépetl reawakened after increased unrest on December 21 with a series of explosions. Current activity since 1994 has formed more than 27 small domes that have been destroyed explosively; ash from the largest of these eruptions covered areas more than 100 km away. Mexico City (20 million people) is 65 km to the west and the city of Puebla (2 million people) is 45 km to the east but there are also many small towns and cities on the flanks of the volcano and on the ravines nearby that are vulnerable not only to ashfall hazards but also to pyroclastic flows and lahars. The volcano in 1994 was still capped by glaciers on the northern and western flanks. Some eruptions have been preceded by changes in the gas and spring water chemistry, deformation, volcanomagnetic signals and seismicity. Volcanic tremor increased in a matter of minutes before each lava fountaining episode began at Etna in Sicily during the 2000 activity. On the other hand, in a much larger eruption in the Philippines, the Pinatubo eruption in 1991 was preceded by precursors two months before the eruption and intense long period seismic event (LP) swarms escalated 10 days before (Wolfe and Hoblitt, 1996). Cumulative seismic energy can also be used to forecast some eruptions. Tokarev (1963) based his predictions of the 1959, 1961 and 1963 Bezymianny eruptions in Kamchatka, Russia on the hyperbolic extrapolation of the cumulative seismic energy release against time. Long period seismicity can be a useful precursor since it signals pressure induced disruption which may be lead to eruption (Chouet, 1996). Volcanomagnetic signals can also indicate that the volcano is heading towards eruption. Small short-term precursory magnetc signals occurred at Merapi Volcano before the 1992 eruption, where rapid signals were associated with changes in the stress field (Zlotnicki and Bof, 1998). Chemical changes in the gases and spring water may also precede an impending eruption. Decreasing pH and increases in Radon and S/Cl may also be indicative of a oncoming eruption but can reflect changes in the hydrothermal system as well and do not necessarily end in eruption The ratio of HCl/SO2 at Sakurajima in Japan increased prior to eruption in 1979 (Hirabashi et al., 1982). Fischer and others (1994) concluded that the shallow LPs at Galeras Colombia were produced by SO2 accumulation under the crater. Rising temperature in fumaroles and crater lakes before eruptions has been documented at several volcanoes. The lake level at Taal volcano in the Philippines went down about one meter before and after the eruption of 1965, probably due to evaporation and temperature increased between 4ºC and 17ºC before the 1967 and 1968 eruptions (Alcaraz and Cardoso, 1969). Small Strombolian and Vulcanian eruptions with dome forming episodes occur at least once each century at Popocatépetl while Plinian eruptions take place on the order of 1,000-3,000 years (De la Cruz et al., 1995a; Macías et al., 1995; Martin Del Pozzo et al., 1997). Major collapse events have also occurred at least twice. The last sector collapse Mount. St. Helens-type event on which the present day Popocatépetl cone formed, was dated at about 23Ka by Siebe etal. (1995). This eruption produced the debris avalanche and its hummocky topography found to the south of the volcano. One of these eruptions dated at 12,900 ±400 to 14,280±240 yr BP. by Mooser (1967) produced the 15 cm thick pumice and ash fall (PWA) found to the west, in Mexico City. Fumarolic activity has been common even since pre-Columbian time as is clear from its name Popocatéptl which means Smoking Mountain in the Nahuatl language. Pre-Columbian settlements to the northeast of the volcano were covered by surges, pumice fall from Plinian eruptions and lahars on several occasions (Seele, 1973; Siebe et al., 1996; Uruñuela and Plunket, 1998). Chimalpain (1612) referred to an eruption in 1347, when Popocatépetl smoked, before that, the volcano was called Xalliquehuac, flying ash. 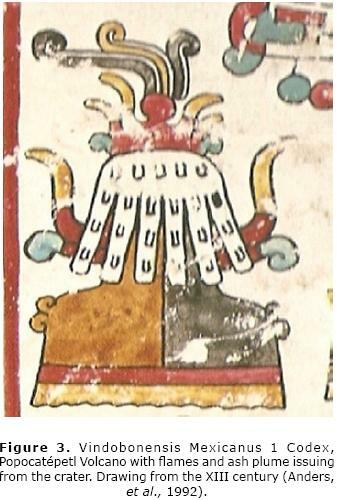 Among other eruptions, the one in 1363 was seen by the Aztecs and their neighbors (Chimalpain, 1612; Alvarado-Tezozómoc, 1609; Figure 3). In the early fifteen-hundreds many small eruptions occurred, but Díaz del Castillo (1575) refers to a larger one in 1539. One year later, the smoke, noise and ash scared the people of Huejotzingo, Quetlaxcoapan, Tepelacac, Quauh-quecholla, Chololla, and Tlaxcallan; ash covered the fields and the cities and burnt the crops and the trees (López de Gomará, 1552). Ash fall was also reported in Atlixco, Tochimilco, Calpa, Puebla and Tlaxcala (Torquemada, 1615), and the Franciscan Codex (1889) mentions that ash fell much further away. The 1590 eruption was also explosive (Acosta, 1590). 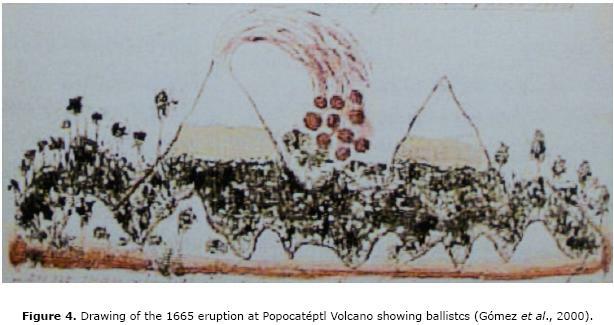 The ash from the 1663 eruption caused darkness in the area and activity continued in 1664 and 1665 when a strong explosion produced heavy ash and pumice fall on the city of Puebla causing roof collapse (Alcalá y Mendiola, 1664; Vetancurt, 1697; Figure 4). 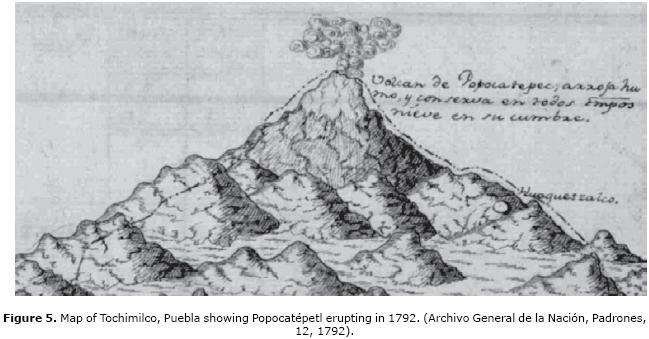 The volcano was also active in 1697, 1720 , 1792 and 1804 (Humboh, 1811; Figure 5). The last eruptions preceding the current eruptive activity occurred in the 1920s (Camacho, 1925). The eruptions produced ash fall for several years and at least one crater dome was formed. It was later partially destroyed and a small lake formed inside it. Murillo (1939) mentioned a 3 km ash plume in 1921 and 3 explosions in 1925 that produced ash fall to the south. 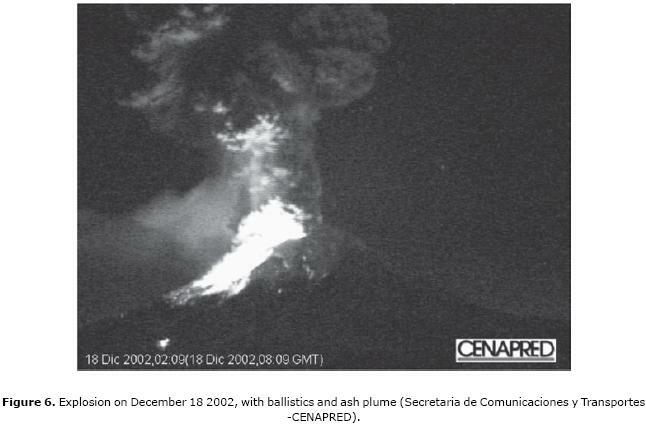 After increased fumarolic activity, in the early morning of December 21, 1994, Popocatépetl began erupting again. Ballistics were ejected several km from the crater and ash was carried eastward to the city of Puebla. These phreatic eruptions continued until December 31 and then became wider spaced until April 30, 1995. It was not until March 1996, that eruptions began again. The frequent plumes over 4 km high, that month, produced ash fall over cities to the east and southeast. The first cráter dome was seen on April 20 and 10 days later it was partially destroyed by an explosion coincident with the formation of another new dome. This explosion killed several climbers that were in the area off limits. There were several eruptions months apart in late 1996 but the October and December eruptions were the largest. In 1997, Popocatépetl was very active. Eruptions in March and April escalated in May and June and on the 30, the ash plume which reached 13 km was carried to Mexico City causing visibility problems, traffic jams and flight cancellations. The new crater domes that were formed in August and December were destroyed explosively. The main eruptions in 1998 occurred on April 21 and 27, August 14, September 22 and 23, October 5, and increased in November and December when ejecta produced large impact craters up to 5 km from the crater. During 1999, activity was relatively low, and was followed by dome formation in February-March and August-September 2000. Activity went up in October 2000 leading up to the larger eruptions in December 2000 and January 2001, which are related to several magma batches and can be considered belonging to the same eruptive sequence. Changes in different monitoring parameters were detected several months before the main activity in December-January and will be discussed in the following sections in further detail. Seismicity and other precursors increased since October and again in mid December which resulted in the formation of a large dome that nearly filled the cráter and several large ash eruptions from December 12 on. The biggest eruption on January 22, 2001, formed a plume that reached 18 km and produced mixed pumice and ash fall hundreds of kilometers to the east and pyroclastic flows and associated mudflows that nearly reached the closest towns. After the large eruption, activity declined with only small eruptions except for the one on July 3 when the ash plume reached 9 km asl. A new dome formed in March 2002 followed by small ash eruptions in April, May, June and July and larger explosions in November and December 2002 (Figure 6) and in February, June and July 2003. Activity in 2004 was low. Large eruptions occurred in July and December 2005, and July 2006, but the year was marked mostly by dome growth and small eruptions. In 2007, another small dome grew in the crater and only minor eruptions took place, but in 2008 larger ones occurred in January and February with small ash emissions in March, April, May, November, and December. Small emissions continued in 2009 and increased in October and November, but activity went down again afterwards and it was not until June 2010 that other ash emissions occurred. During 2011, small eruptions took place in January and March and larger ones in May and June followed by small eruptions again in August. A new dome formed in early September and was partially ejected on September 26 (Figure 7). At the beginning of the eruptive period in December 1994, a scientific committee was set up to asses the eruptive activity and advice federal and local authorities on the state of the eruption. Daily meetings were programmed at the start of the eruption where the seismicity, COSPEC measurements (SO2), deformation, spring water chemistry, ash distribution and components were discussed; meetings were frequent at the beginning and were more widely spaced when activity declined. A seven color-coded volcanic alert system for Popocatépetl was implemented for Civil Protection agencies and simplified into a three color alert for the general public (De la Cruz and Tilling, 2008). The warning system is based on scientific data and its interpretation. The level of the Volcano Traffic Light Alert System indicates the most probable scenarios based on the volcano monitoring data and visible eruptive activity and sets recommendations for the Civil Protection authorities and population at risk. When the volcano is quiet and has only sporadic seismic events, the alert is classified as green phase 1 and is increased to phase 2 when there is fumarolic activity and low level seismicity. When low level seismicity increases, the level changes to yellow which is subdivided into three phases based on the level of activity and expected phenomena: moderate explosions with gas emission and light ash fall (phase 1), intermediate to high explosivity (phase 2), ash fall and small lahars, growth of lava domes (phase 3). The red alerts are issued when there is a possibility of large pyroclastic flows and lahars (phase 1) and large scale stratospheric plumes and/or massive sector collapse (phase 2). The National Civil Protection System carries out coordinated action for protection and prevention and participates in the risk management. A hazard map was prepared with the existing geological information at the time. 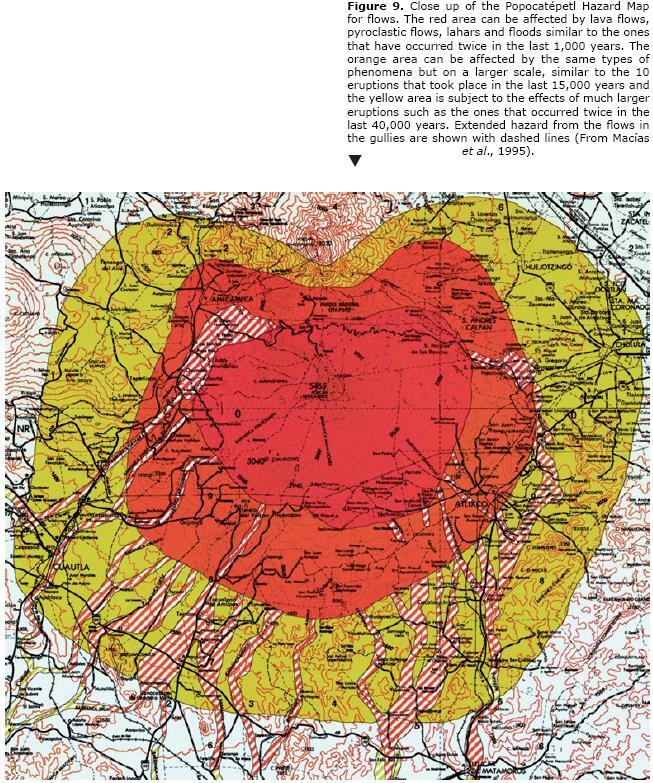 The hazard map shows fall deposits (Figure 8), pyroclastic flows and lahars (Figure 9) in three different colors (red, orange and yellow) depending on their hazard level, (Macías et al., 1995). The map has been the bases for planning and evacuation for federal, state and local authorities. Risk perception may vary among scientists, authorities and the general public which makes decisión making difficult, but adequate analyses of scientific information, consensus and good communication can result in an adequate respon-se and reduce vulnerability. Permanent monitoring was set up at Popocatépetl several years before the current eruptions began in December 1994. A three-component short period telemetred seismic station was set up at Cerro Tlamacas (PPM), 4.8 km northeast of the crater, in 1989 by the Instituto de Geofísica of the Universidad Nacional Autónoma de México (UNAM) and another station was established at Altzomoni, 12 km to the north of the summit by the Engineering Institute of the same university, two years before. 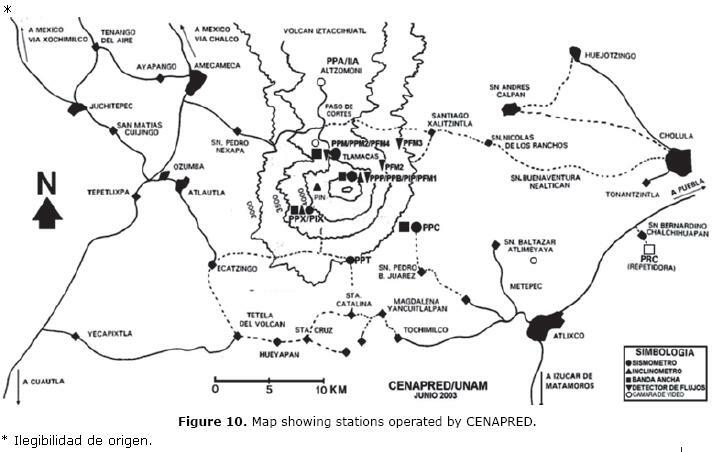 Shortly before the eruptions began in 1994, two more seismic stations at Chiquipixtle (PPX) about 4 km to the southwest and Colibri (PPC) 7 km to the southeast of the summit were installed by the Centro Nacional de Prevención de Desastres (CENAPRED) they also installed two more in January 1995 (PPB and PPP). Seismic signals are received in real time and processed at CENAPRED and the Institute of Geophysics in Mexico City. The stations are short-period 1 Hz stations that were operating on the flanks of the volcano between 3,200 and 4,200 m asl (Figure 10). Before this, only temporary portable networks were set up on the cone for short periods of time. The first visual monitoring camera was installed at Alzomoni in January 1995 and since then, two more were, set up at Tlamacas and Tianguismanalco to the north and east of the summit. A leveling line and three dry tilt stations on the north, northwest and northeastern flanks of Popocatéptl were measured periodically from 1988 to 1994 but no significant deformation was noted (Panohaya-Analco, 1991; Villareal, 1995). At the beginning of the eruptions, four tiltmeters were added to the seismic stations and geodetic measurements were also carried out with laser range finders on a small network on the northern flank since 1992 (De la Cruz et al., 1995b; De la Cruz and Tilling, 2008). Cabral et al. (2008) also installed a GPS network on the northern and southwestern flanks of the cone in 1994 at about 4,000 m asl. Correlation spectrometry (COSPEC) airborne measurements of SO2 emission were begun in February 1994 and later extended to measurements on tracts near the volcano. Chemical monitoring of the springs on the volcano began in 1988. Vulcanomagnetic activity has also been monitored since 1997 when the TLA telemetred permanent total magnetic field Geometrics G-56 station was installed near Tlamacas on Popocatépetl's northern flank at Cruz Blanca. Several years later, in 2005, another Overhauser magnetic station was installed at Chiquipixtle (CHX). The magnetometers record the total magnetic field every minute and data is then transmitted by radiomodem to the Institute of Geophysics. This data is processed with data from the base station at the Teoloyucan Magnetic Observatory to eliminate magnetic effects that are not related to the volcano (Martin Del Pozzo et al., 2008a). Popocatépetl showed several signs of volcano unrest leading up to the 1994 eruption, nonetheless due to their small magnitude, forecasting was inconclusive at the time. 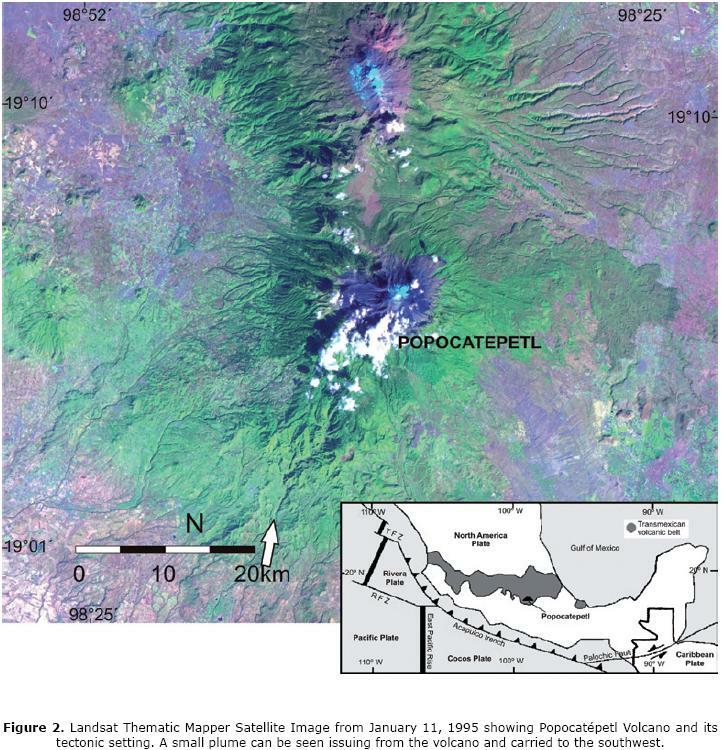 Since 1988, several volcano tectonic seismic events (VTs) were detected in a temporary portable network and after 1989 at the Tlamacas station at Popocatépetl, but it was not until 1993 that seismicity, water temperature in the crater lake and fumarolic activity rose significantly signaling the reawakening of the volcano. Spring water monitoring also showed increasing concentrations of chemical components such as pCO2 and HCO3 several months before the eruptions began. Probably the main precursors to eruptions are VTs characterized by high frequency and impulsive arrivals but long period seismic events (LPs) and harmonic tremor also precede certain eruptions. De la Cruz et al. (2008) studied the seismicity recorded by the PPM station from January 1990 to December 21, 1994, when the eruptions began. They recognized several stages in the VTs leading up to the eruption associated with the thermal effects of a magmatic intrusion at depth, fracturing linked to opening of pathways, stress concentration accelerating the process and stress redistribution before the eruption. The cumulative seismic energy reflects the stress which leads to material failure and produces a logarithmic increase in the strain rate (Reyes-Davila and De la Cruz, 2002). 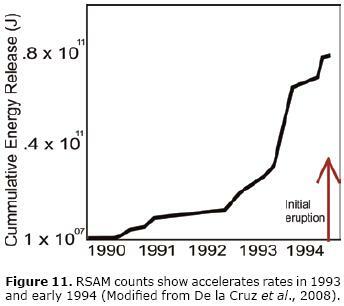 The accelerating rates of strain and seismicity can be seen in Figure 11. The sharp increase is noted in 1993 and early 1994, several months before the eruption. The number of events and the acceleration rate of the cumulative energy decreased afterwards but increased again shortly before and again went down briefly before the eruption, reflecting fracturing and relaxation. The onset of the eruption on December 21, 1994 was marked by a swarm of VTs. 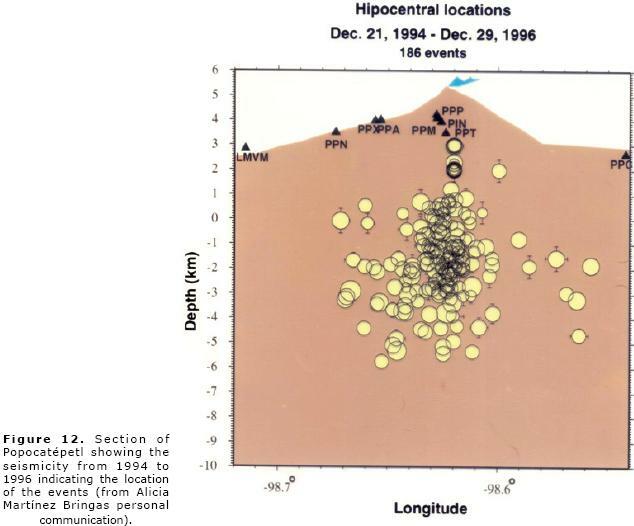 Long period seismicity (LPs) increased from 7 events a day in October 1994 to 22 events in December 1994 and to 49 events on the day of the eruption on December 21. The frequency of the LPs and tremor suggest a shallow source 2.5 km beneath the crater and depths for VTs between 2.5 and 10 km (Arciniega et al., 2000; Figure 12). A day after the eruption started, volcanic tremor began (Valdés et al., 1995). Volcano tectonic events (VTs) at Popocatépetl are located below the crater and to the southeast. Their fault plane solutions indicate that below the crater they have N70ºE pressure axes and normal fault mechanisms with some reverse events between 0 and -3 km asl. The tension axes are radial. On the other hand, VTs on the southeast flank have S-N and W-E pressure and tension axes and strike-slip solutions (Arámbula-Mendoza et al., 2010). Espíndola et al. (2005) found three families of VTs (2< Mc< 2.5), two to four km deep at Popocatépetl which they considered to be stress related associated with magma movement through the conduit from September though December 1995, but no eruptions occurred until March 5, 1996. De la Rosa-Moreno et al. (2003) also classified the long period events into 7 families and distinguished that three of them were precursors to important eruptions at Popocatépetl. The June 30, 1997 eruption was preceded by VTs, double LPs and very long period LPs lasting several minutes and followed by tremor. Tremor and LP swarms were associated with the formation of the dome from August to December 1997. Compression dominated (reverse solutions) events gave way to an extensional regime in the later stage (Arámbula-Mendoza et al., 2010). From December 25 to November 22, 1998 compression occurred at depth (-2.5 to -0.5 km asl) while there was extension at shallower levels and strike-slip solutions for the events on the southeast. In certain cases, changes in the stress field associated with tectonic earthquakes can trigger eruptions. De la Cruz et al. (2010) considered that precursory accelerating patterns after the M 7.0 tectonic earthquake, 143 km from Popocatépetl were associated with the first stage of material failure that triggered the June 15, 1999 activity at the volcano. Arciniega et al. (2008) described 3 types of LP events with hypocenters less than 2 km below the cráter floor when they carried out a broadband seismic experiment at Popocatépetl from December 1999 to March 2000. Type 1 degassing events have impulsive first arrivals and a harmonic wave train with periods of 1.4-1.9 s related with a very long (30 s) wavelet. They are thought to be produced by expanding gas pockets coupled with acoustic resonance in the conduit (Chouet et al., 2005). Type 2 LPs are superimposed events with slowly emergent first arrivals made up of successive wavelets with a period of near 30 s and Type 3 LPs have emergent first arrivals and harmonic signature with a dominant period near 1.1 s and are associated with dome formation. In February and March 2000, they were linked to lava extrusion. Broadband signatures during the Vulcanian eruptions in April and May 2000 lasted 30-80 min. After growth of the small lava domes in February-March as well as in August-September 2000, seismicity went up in October: VTs increased in magnitude and number and ash emissions grew larger. The December 2000-January 2001 activity at the volcano was preceded by important changes in seismic, chemical and magnetic parameters. Periods of high amplitude volcanic tremor began on December 6 following a swarm of six VTs. Swarms of VTs occurred again on December 8 and 9 and on December 12, emissions increased considerably (De la Cruz and Tilling, 2008). Very high amplitude harmonic tremor began again on December 15 and rose to saturation level on all Popocatépetl seismic stations. The strong tremor lasted 10 hours and began again 16 hours later. Valdes et al. (2001) considered that these tremor episodes followed a time predictable loading-discharge process making it possible to forecast the next episode. The harmonic tremor on December 15, 16 and 17, 2000, and a sharp 200urad deformation was associated with the tremor and a high effusion rate for the dome, ≈ 180-200m3/s (De la Cruz and Tilling, 2008). The large dome reached 50 m from the eastern edge of the crater. RSAM is a real time seismic amplitude measurement that provides information on the cumulative seismic energy. The RSAM plot clearly shows the June 30, 1997 and December 12, 2000 steps (De la Cruz and Tilling, 2008). Several other eruptions can also be recognized on the plot such as the ones on March 5, 1996, when eruptions began again after ceasing for about 10 months, the April 21, 1998 and the November 25, 1998 eruptions (Figure 13). Figure 14 also shows that the VT cumulative energy went up sharply associated with many of the eruptions such as the ones in March 21, 1997, June 30, 1997 and November 1998. The differences between Figure 13 and 14 are due to the seismic energy released by LPs and tremor, specially the large amplitude harmonic tremor from December 15-19. The large explosion on January 22 was preceded by reverse and strike-slip events several weeks before and later on by a normal VTevent (Arámbula-Mendoza etal., 2010). Novelo-Cassanova and Martínez-Bringas (2005) found a highly attenuating body 6-8 km below Popocatépetl which could be attributed to presence of magma. Berger et al. (2011) also report low velocity bodies, 4-7km to the north of the crater, 4-9 km to the southeast and 7 km bsl under the crater, as well as strong lateral heterogeneity in their 3D tomography of Popocatépetl. There was no significant deformation at Popocatépetl between 1988 and 1994 (measurements on the leveling line and dry tilt stations). Cabral et al. (2008) considered the volcano a minimally deforming system based on data from their GPS network and detected only small transients in early 1997 and late 2000 associated with higher dome effusion rates which formed the larger domes. The only deformation detected in the electronic tiltmeters was linked to the tremor in December 2000 showing tilt oscillations of up to 100- 200 urad (Valdés et al., 2001). We were able to visibly detect lateral deformation in the crater dome preceding the January 22, 2001 eruption from the aerial photographs taken by the Secretaria de Comunicaciones y Transportes by request of the Scientific Committee, although most of the magma from the 2001 eruption was probably already in place since there were relatively moderate changes in the activity in January (Martin-Del Pozzo et al., 2003). Changes in gas and spring water chemistry as well as in soil degassing and ash leachates preceded the different eruptions as well. The SO2 flux was lower in 1994 at the beginning of the phreatic phase (4.6 Kt/d) and increased when the eruption turned magmatic (10-13Kt/d) between 1996 and 1997 (Delgado-Granados et al., 2001). The SO2 flux rose drastically on December 13, 2000, reaching over 50Kt/d (Valdés et al., 2001). Before the eruptions began in December 1994, there was a small lake inside the crater which dried up before the formation of the new domes in 1996. The chemistry of the water in the crater lake changed significantly before the eruption. Between 1985 and 1994, the SO42- content doubled and chlorides increased from 12,400 mg / l to 14,200 mg/l. Temperature also went up from 29º to 65 ºC (Armienta et al., 2000). Spring water monitoring since 1988 has shown that small peaks in HCO3 concentration and PCO2 are associated with incoming magmatic batches at Popocatépetl Volcano. Oxygen and hydrogen isotopic data indicate that the water system is controlled by magmatic recharge, but large amounts of CO2 from the magma associated with degassing come into the system before eruptions (Martin Del Pozzo et al., 2002a; Martin-Del Pozzo et al., 2002b; Inguaggiato et al., 2004). Helium and carbon isotopic signatures are also consistent with magmatic gas input. The concentrations of SO4, CI, F, HCO3 and B, also increase before the main eruptions, Armienta et al. (2008) also noted some chloride and sulfate changes and the presence of boron preceding or coincident with increased volcanic activity. Ash leachates can also indicate changes in the type of activity. The SO42-concentration (19 550 ppm) in ash leachates from the initial eruption on December 21, 1994 decreased sharply afterwards and the same occurred the following year after a 10 month pause in the eruptive activity (Armienta et al., 1998). This could have been produced by accumulating gas and rock scavenging before these eruptions. An increase in F- before the extrusión of the first lava dome was probably related to heating up of the system consistent with SO42- and Cl- concentration trends which reflected more of a magmatic signature in 1996 than during the phreatic phase the year before. This is also supported by the phreatic character of the ejecta in 1994-1995 and the first week in March 1996 which turned magmatic after March 11 and resulted in dome extrusion on March 20 (Martin-Del Pozzo et al., 2008a). Ivanov et al. (1996) also detected that leachates from the first phase of the 1991 Avacha eruption in Kamchatka were phreatomagmatic and turned magmatic the next day. Sulphur isotopes for the first leachates reflected mixing of magmatic and hydrothermal components (δ34=+11,‰ CD) while the ones from the later date had magmatic signatures (δ34=+7.5‰). At Mt. St Helens the ash leachates from March and April also had low SO42- ~ 100 ppm and Cl-~ 600 ppm, reflecting their phreatic nature while concentrations went up to >3,000 ppm SO42 and > 1,000 Cl- during the climatic eruption in May (Stoiber et al., 1980; Stoiber and Williams, 1990). Armienta et al. (2010) considered the Popocatépetl ash leachates from September 1999 to October 2000 related to hydrothermal alteration, but from November to December 2000, preceding the eruptions, F- increased suggesting renewed heating of the system linked to an intrusion at depth. The S/Cl ratios also increased during 2000. Radon behavior can also indicate volcano unrest. The maximum soil radon peaks at Po-pocatépetl occurred in December 1994 and correspond to the onset of the eruptions. Higher 222Rn values preceded the appearance of the December 1997 dome and eruption (Armienta et al., 2002) and a large soil radon peak at TLA (4,000 m asl) correlated with explosions that destroyed the lava dome. (Segovia et al., 2002, Segovia et al., 2005). A small increase in soil radon also occurred in November and December 1998 related with the eruptions. The December 2000 and January 2001 eruptions were also preceded by increasing soil radon at TLA several months before and peaked in December (Segovia et al., 2002). In February and April 2002 as well as in September and November 2002, radon also increased during dome formation and associated with the activity in February 2003. Magnetic signals can also indicate periods of magma injection and gas pressure build-up; Negative magnetic anomalies during 1998-1999 were considered to be thermal caused by hot incoming magma while positive anomalies were related with dome cooling above the Curie point. Kotsarenko et al. (2008), also noted thermally induced changes in the geomagnetic record. Sharp positive anomalies are stress related as was seen in the correlation with a tectonic regional earthquake and explosions (Martin-Del Pozzo, 2002c). Negative magnetic anomalies 5 to 37 nT, were recorded from 1-8 days before eruptions. The eruptions in December 2000 were preceded by an increase in VTs and in harmonic tremor episodes which resulted in several large ash plumes and a large dome that filled the crater up to 50 m from the rim. Ash eruptions followed the increase in the tremor amplitude on December 12 and 13, and on the 15, tremor amplitude rose again and remained high for 4 days associated with ash eruptions and dome effusion. The largest eruption since 1994 occurred on January 22 with few precursors except for the VT event that day. The eruption was triggered by mixing of a mafic olivine-bearing melt with a more evolved magma (Martin-Del Pozzo, 2003). Magma probably started rising since October (5 nT) when seismicity first increased and the marked negative anomaly occurred and then continued with new rising magma batches reflected in the other anomalies shown in Figure 16. 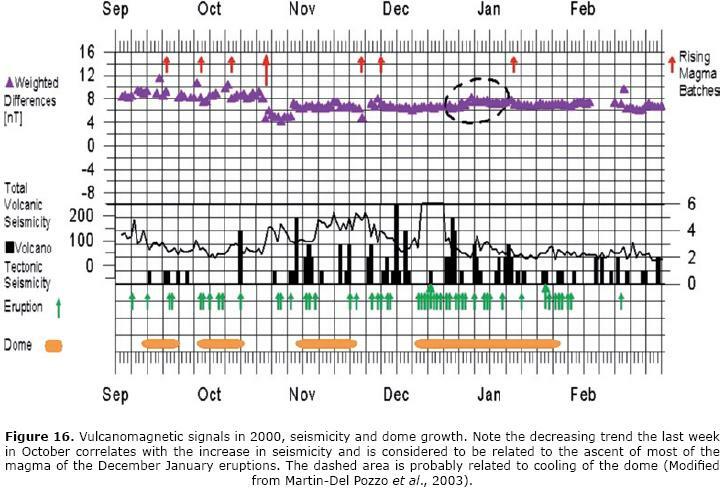 During 2006 negative magnetic anomalies were again correlated with periods of harmonic tremor and interpreted as indicators of ascending magma and dome precursors (about 7 days) followed by increasing signals linked to cooling of the domes (Martin-Del Pozzo et al., 2008a). From 1994 to early 1996 ejecta consisted of non-juvenile material that gave way to juvenile ejecta with the formation of successive domes from April 1996 on. 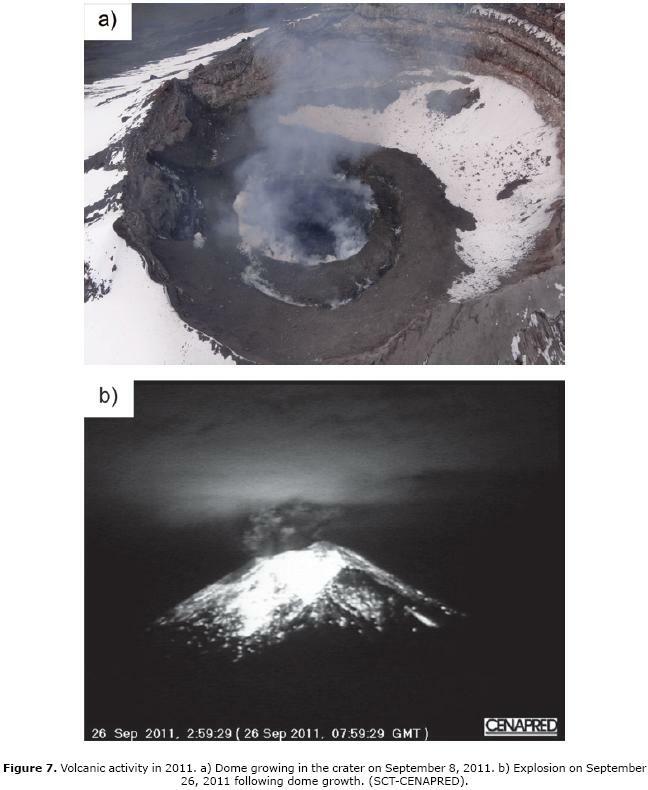 A glass component was first detected at Popocatépetl in the ash from March 11, a week before the appearance of a new crater dome (Martin-Del Pozzo et al., 2008b). There are at least two magmatic components at Popocatépetl, a mafic magma that crystallizes near the Moho and a more evolved component with which it mixes at depths of between 4 and 13 km (Straub and Martin-Del Pozzo, 2001). Several months before the December 2000-January 2001 eruption, ash components changed. A large percentage of crystals, instead of lithics from the dome, reflected the changing conditions at the volcano. Many of the Plinian eruptions at Popocatépetl were preceded by phreatomagmatic activity. These eruptions began with surges that underlie the Plinian pumice deposits. Espinasa and Martin-Del Pozzo (2006) and Arana-Salinas (2010) dated an orange pumice fall at 4650± 100 yr BP-4965±65 yr BP. This Plinian eruption began with a phreatomagmatic explosion and erupted about 2 km2 (DRE) of magma (Arana-Salinas et al., 2010) but other eruptions such as the PWA (-14000 yr BP) were much larger. Eruptions at several volcanoes in Mexico have been preceded by increasing VTs, LPs and tremor, chemical changes in the fumaroles and some by deformation. Colima is Mexico's most active volcano. Historical activity at Colima Volcano shows that Plinian eruptions occur about every 100 years, separated by repose periods several decades long followed by effusive activity which produces short viscous lava flows accompanied by dome growth and Merapi and Vulcanian eruptions with pyroclastic flows in the larger eruptions (Martin-Del Pozzo et al., 1995; Saucedo et al., 2002 and 2010). Conditions at the volcano now are similar to those that precede explosive eruptions. Fonseca and Martin-Del Pozzo (2010) proposed 7 scenarios for a Plinian eruption based on isopachs, daily radiosonde wind and socioeconomic data. The situation now prevailing at the volcano is similar to the one preceding explosive eruptions, so Civil Protection agencies and scientists have been working closely with the population. Evacuation drills with towns such as Juan Barragán and Becerrera were frequent in 1998 and 1999, and some of the people living in the town of La Yerbabuena were relocated further from the volcano. Seismic and chemical monitoring are carried out mainly by the University of Colima personnel, and a local scientific committee from the university meets with authorities when activity increases. Part of the volcano is in the state of Jalisco so joint meetings also are planned. 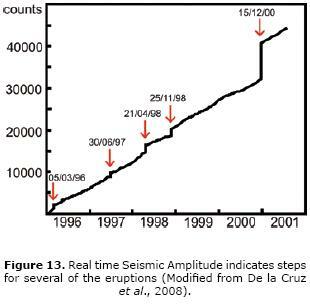 Short-term forecasting at Colima showed increases in seismicity and deformation in 1991 (Gonzalez-Pomposo et al., 1993) and in 1997-1998 (Zobin et al., 2002). In 1991, dome growth occurred from March 1 to April 16, and before the partial collapse of the dome, the frequency of the volcanic tremor increased from 3.0 to 9.0 Hz and returned to lower frequencies sharply after the event (Gonzalez Pomposo et al., 1993). 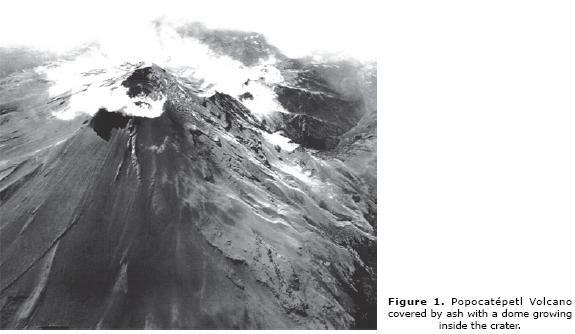 Distance measurement on the dome and summit cone of Colima Volcano showed accelerated expansion before the 1998 eruption (Murray and Ramírez-Ruiz, 2002). Steady inflation, increases in S/Cl and SO2 (400 t/d- 1600 /d) in the fumaroles, and earthquake swarms 8 km beneath the summit which became shallower, were among the precursors which led up to the 1998 eruption (Zobin et al., 2002). Fumaroles at Colima showed a peak in the S/Cl and deuterium, one year before the activity in 1998 and SO2 flux increased from 400T/d to 1600T/d before the eruption (Taran et al., 2002). Lopez-Loera and Urrutia-Fucugauchi (2003) also recognized vulcanomanetic precursors before the 1998-1999 eruption. Chichón Volcano has had an explosive history with periods of large dome formation (Espíndola et al., 2000). The last of these crater domes was destroyed in 1982. Three large Plinian eruptions and several small ones in between, took place on March 28 and April 3-4 1982, which destroyed the summit dome and covered eastern Mexico with ash and areas up to 6 km with surges and pyroclastic flows. The Chichón eruption resulted in about 2000 casualties and left 20,000 homeless (De la Cruz and Martin-Del Pozzo, 2009). The lack of coordinated action and the differing scientific opinions caused confusión in the authorities and population and were partly responsible for the disaster. At least one month of shallow seismicity detected by the Comisión Federal de Electricidad at the dam nearby, preceded the Chichón eruption in 1982, but local inhabitants mentioned small quakes up to one year before. Episodes of LP swarms preceded the March 30 and April 3 eruption, and tremor intensity increased which was detected on a portable network with five MEQ-800 Sprengnether smoked-paper seismic stations set up on March, 29, 1982. Parícutin was born in 1943 and erupted for 9 years producing heavy ash fall and lava flows that covered several villages nearby; Parícutin, Zirosto and San Juan Parangaricutiro had to be evacuated. Precursory earthquakes at Parícutin Volcano occurred from January 7, 1943 until February 20, the outbreak of the eruption (Flores Covarrubias, 1945). Twenty-one volcanic earthquakes above magnitude 3 (3.2-4.5) were recorded mainly by the Weichert seismographs at the Tacubaya station in Mexico City, 320 km from the volcano. Maximum earthquake magnitudes increased before the eruption with the excerption of the first shock, and the cumulative precursory seismic energy release was very high, 2x1019, ergs, consistent with the energy needed for the formation of a magma filled crack (Yokoyama and De la Cruz, 1990). Six months before, noises and heat marked the site where Parícutin would be born. The first eruptions at Popocatepetl were phreatic and turned magmatic a year later, after a 10 month cease in the eruptive activity. The first eruptions were preceded by increases in the seismicity and chemical changes in the crater lake and spring water, as well as in the fumarolic activity several years before, slowly leading up to the eruption. Shortly before the eruption began, these monitoring parameters went up again and decreased shortly before, associated with increased fracturing and degassing and later relaxation. From April 1996 on, dome formation and Vulcanian eruptions were also preceded by LP and VT events. Juvenile ejecta was detected one week before the appearance of the first dome and the rising F concentration in the leachates was attributed to a heating up of the system. The larger events such as the ones in 1997 and 2000-2001 were also preceded by an accelerated rate of seismic energy release. Especially high amplitude harmonic tremor preceded and accompanied the activity in December 2000 which resulted in the large crater dome and ash emission. Preceding this activity, increased seismicity was correlated with negative magnetic anomalies, rising SO2 flux and radon in the soil, two months before, although seismicity escalated a few days before the eruptions. The largest eruption on January 22, 2001 produced pyroclastic flows and associated lahars that reached one km from the nearest town. Before the eruption began, the stress induced by the ascending magma caused fracturing and opening of passageways which is reflected in VT behavior and resulted in eruption. The acceleration rate of the cumulative seismic energy release was slow possibly because of the successive magmatic batches that could not make their way through until December 1994. In andesitic volcanoes eruptions can occur when the cumulative seismic energy release is -10 10-11 (Yokoyama, 1988). Pathways are obstructed and later cleared by increasing pressure from the degassing incoming magma. These explosions allow new lava to make its way up and form domes. The negative magnetic anomalies correlated with episodes of harmonic tremor that precede dome formation by several days are linked to ascent of magma batches. Seismicity which precedes eruptions is of 3 basic types: long period events that are related to degassing-pressure induced disruption, vulca-notectonic events linked to brittle failure and fracturing and harmonic tremor which in many cases, as in Popocatépetl, is associated with underground movement magma. Decreasing pH can be due to dissolution of acid volcanic gases that mixes with the spring water. Seismicity occurs in 2 areas below the crater and to the southeast. Low velocity zones and attenuation indicate there are pockets of magma at about 6-8 km bsl (Novelo-Casanova and Martínez Bringas, 2005; Berger et al., 2011). The Popocatepetl mafic magma crystallizes near the Moho and mixes with a more evolved component at depths of between 4 and 13 km (Straub and Martin-Del Pozzo, 2001). Espíndola et al. (2004) proposed a cylindrical magmatic body with a 3 km radius buried 11 km under the volcano. Chouet et al. (2005), found that the source of the mild Vulcanian eruptions at Popocatépetl in April and May 2000 was 1500 m below the crater and modeled it as a sill with a 10º easterly dip intersecting a northeast striking dike dipping 83ºnorthwest, consistent with the opening of pathways and release of volcanic gases. The real time seismic amplitude measurement (RSAM) analyses are the main forecasting tool, but understanding the different magmatic phenomenon and their timing is essential for the correct assessment of the situation. Some volcanic predictions have been based on the hyperbolic fits to the VT cumulative seismic energy release (Tokarev, 1963; De la Cruz et al., 2008) and time predictable loading-discharge process for large tremor episodes (Valdes et al., 2001).Times of increased probability (TIPS) were estimated by Novelo- Casanova and Valdez-Gonzalez (2008) for seismicity from 1995-2005 who gave a retrospective predictions for the June 30 eruption, January 22, 2002 and September4, 2002 eruptions. A seismic cluster occurred under their algorithm conditions a few days or weeks before the eruption. Phreatic to magmatic, explosive and effusive dome activity throughout 17 years has given vulcanologists a chance to study the different processes and their precursors. Considerable advances have been made in understanding how Popocatépetl works. Magma ascent and eruptive precursors are now recognized by harmonic tremor episodes, some LP events and negative magnetic anomalies, but there are still questions that need to be addressed such as constraining the timing of the different phenomena, quantifying thethresholdsof specific types of activity such as for a Plinian eruption and especially how activity would escalate. Multiparameter studies where the seismic, magnetic and chemical data are integrated and evaluated in real time is fundamental for adequate forecasting. At Popocatépetl, several of the eruptions were expected beforehand because of the increasing VTs and LPs and changes in water and soil chemistry. Dome forming episodes were also detected due to the seismic, chemical and magnetic changes before the eruptions. Precursors occurred several months to a few days before the eruptions. Volcano forecasting has been a success where people were saved because the eruption was predicted and they were evacuated in time. Precursors that lead to a clear assessment of the situation with a coordinated response can help mitigate a volcanic crisis, but is possible only if the monitoring network is well equipped and maintained and timely analyses are carried out. The author would like to thank DGAPA-PAPIIT, Yuri Taran and Servando de la Cruz for their helpful suggestions and CENAPRED (Enrique Guevara, Carlos Gutierrez, Ramón Espinasa and Gilberto Castelan) for kindly helping with some of the figures. I am especially grateful to Alan Rodríguez who diligently helped classify the information as well as to Amiel Nieto and Andrés Salinas Omassi for redrafting. The Archivo General de la Nación allowed us to use unpublished documents.